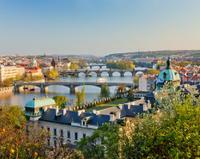 The signature view of the Prague. Was there during the sunset and the view was amazing. After the sun set, the castle lights up and provide a great picture. There are a lot of small shops walking distance from the castle that is worth scouting out.